A third Seydlitz page to offer for your enjoyment a start on a large collection of Seydlitz ephemera. 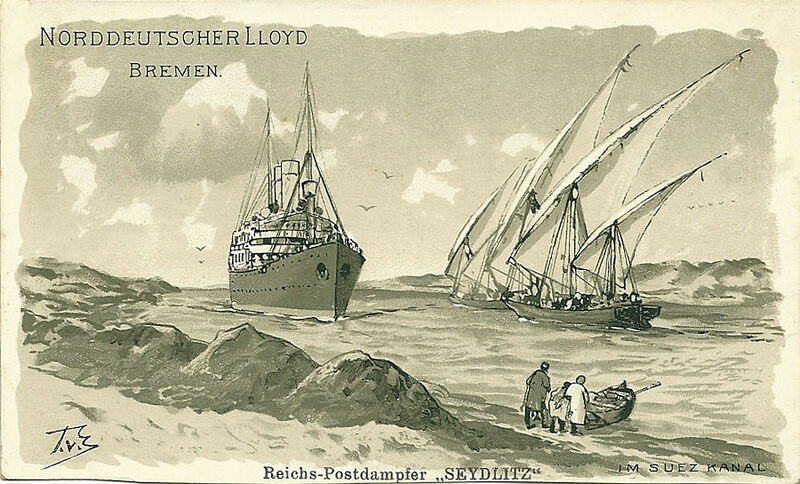 A fine collection of Seydlitz related images kindly provided by Marg & Clem Breuer, of Townsville, North Queensland, Australia. Adolphe E. (Edward) Breuer (1874/1950s), an electrical engineer by training, was born in or around Kohn (Cologne), Germany, the son of Mr. & Mrs. Heinrich Adolph Hubert Breuer-Mulhens of that city. Adolphe emigrated to Australia in the late 1880s, & initially settled in Melbourne. 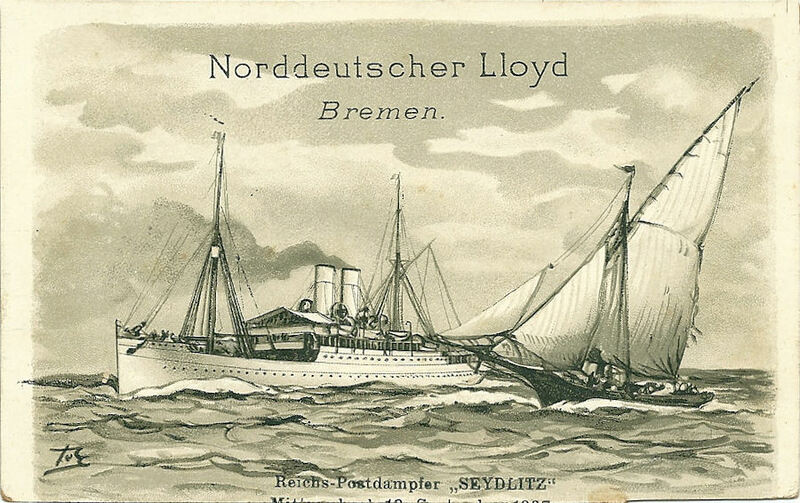 It would seem that Adolphe travelled back to Germany, via Seydlitz, in Sep/Oct 1907 to visit his mother Agnes. In Jul. 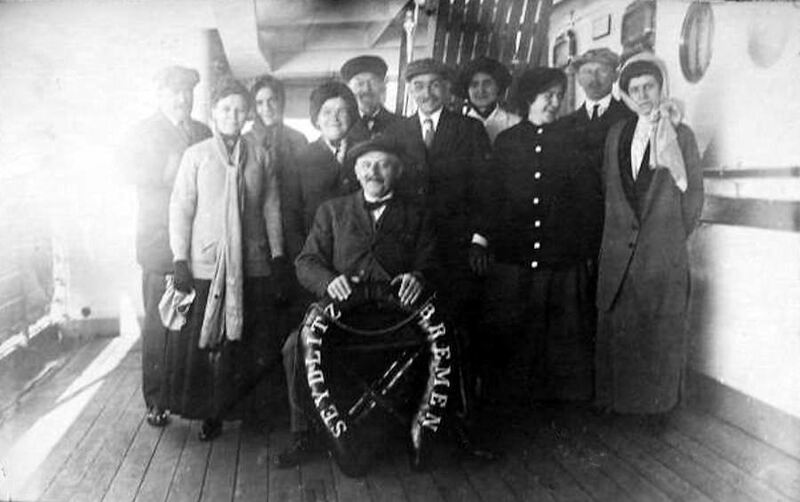 1908, the family, now including a boy born on May 2, 1908 in Germany - Heinrich H. A. (Hubert Adolph) Breuer, (1908/1982), known as Henry - returned to Australia via Norck. 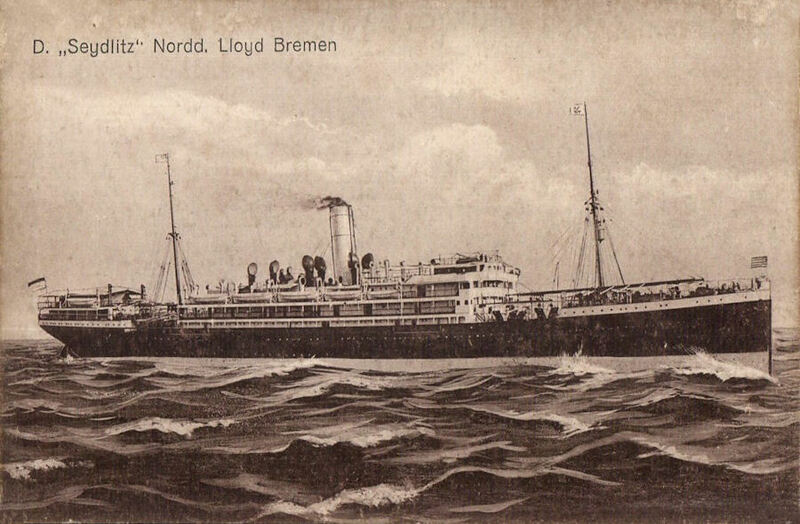 Adolphe later, after WW1, returned to Germany, for the last time, in 1921. In Australia, Adolphe married Bessie Ellis (1878/1945) in Melbourne in 1907, modified his name from Breuer-Mulhens to Breuer & raised a family of three - Henry as above, a daughter named Agnes & a son named Franz. Marg advises that Adolphe owned a Nickelodean theatre in Adelaide for a time. He worked at Brisbane University from 1911 to 1920. In the 1920's he moved to Townsville & taught at the Technical College there until after WW2. Adolphe passed away in the early 1950s. Henry in turn married Hepsey Breuer (?/2011) in Proserpine, Queensland, in 1934. The couple raised a family of 2, a daughter Elizabeth A. (Ann) Breuer born in 1949, & a son named Heinrich A. C. (Anton Clemens) Breuer, known ac Clem, born in 1958. To bring us to the present day, Henry died in 1982. His wife Hepsey long survived him - living until Feb. 2011. Clem married Margaret Scott in 1982 & they have 3 children - Heinrich born in 1989, Nicholas (born in 1991) & Evangeline known as Eva (born in 1993). The Breuer-Mulhens 'rather grand' family graves remain in Popplesdorf, Bonn, Germany are well tended & maintained. 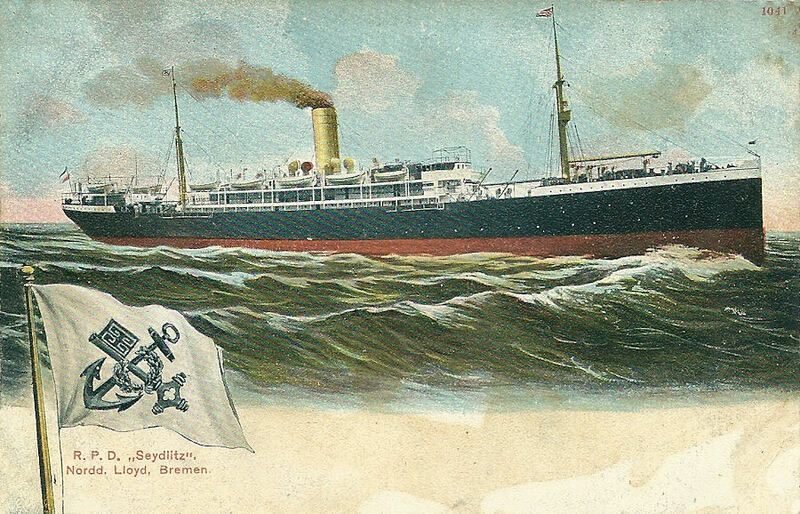 The memorabilia that follows on this page are then from Adolphe's 1907/1908 trip from Adelaide, Australia to Germany, all safely retained over the intervening years. 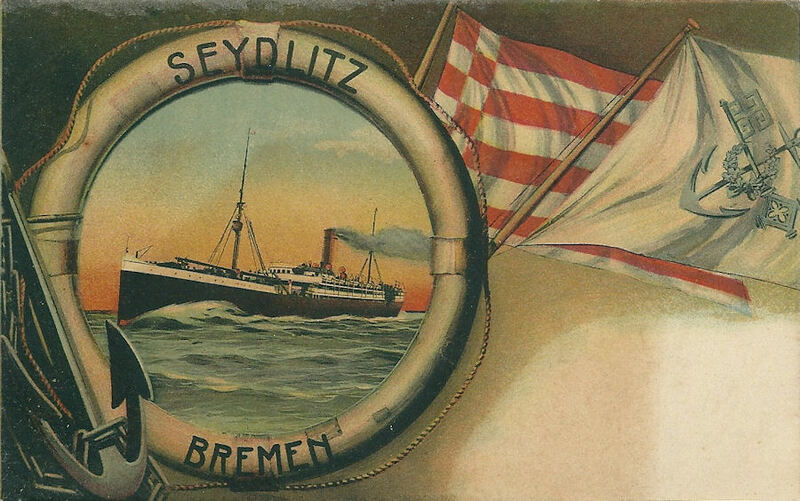 A wonderful group of postcard images of Seydlitz, kindly provided by Marg Breuer. More to come soon! The first image below originates with e-Bay in Dec. 2014. Here. Do drop by! The second was also ex e-Bay but long long ago. 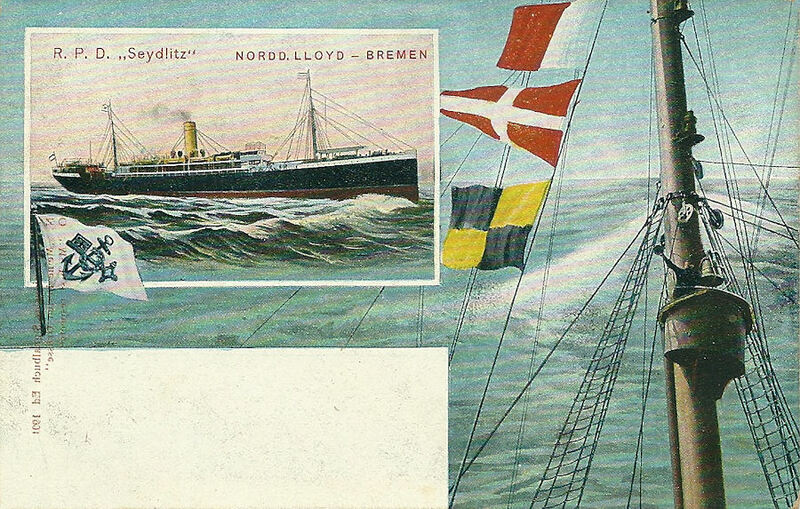 Of passengers aboard Seydlitz in 1914. Maybe you can provide additional data. Or images? 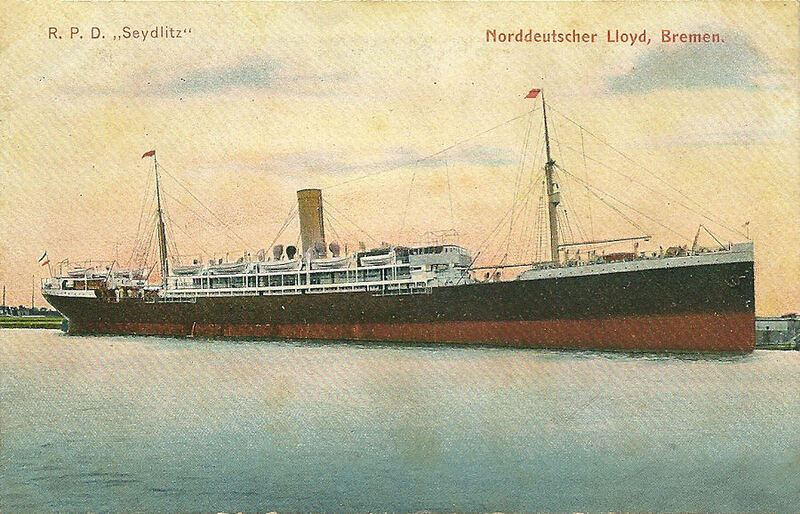 This page will, hopefully, track data about the Seydlitz as it comes to hand. And hopefully data as it specifically relates to the Volturno tragedy. If any visitor can clarify (or correct) or provide more information about any of these matters, I would welcome their help. The first & second Seydlitz pagea are here: 93 & 94.